Released on November 18th 2008. 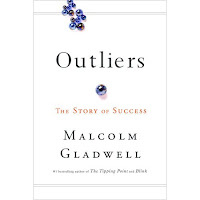 I really liked Malcolm Gladwell's books, The Tipping Point and Blink (especially The Tipping Point) so when I found out he had a new book coming out I totally got excited. His books are so thought provoking, I just love the things he explores. What book can't you wait for to be released? I'm hosting a giveaway for this book! It starts today and ends Saturday. I also love The Tipping Point! jeez! do i sound like an idiot if i say - i have note read any that u mentioned here..! What am I waiting on? Gregg Olsen's "Heart of Ice." He just emailed me asking if I wanted an advance copy. OMG! He rocks!! Yesterday something amazing happened! A review copy of Outliers came in the mail!!!! bermudaonion- Thanks again for letting me know! lenore- It's just amazing isn't it! veens- Hehe that's ok! What are you reading right now? thatonegirlemily- It does doesn't it!